The GOPLifer project has reached its end. I have created a new site called PoliticalOrphans.com, where I’ll be joined by a few friends in posting new material. At GOPLifer I’ve tried to avoid first person writing. Now that it’s time to pack up to move on, it might be good to describe some of the personal history and reasoning that gave rise to this project. John McCain represented the Republican Party’s last chance to turn the tide against white nationalism. It wasn’t much of a chance, but it was all we had. On election night, staffers managed to stop Sarah Palin from delivering the concession speech, but no one could stop Palin from steering the party toward madness. With McCain defeated and a black man in the White House, our collective pathologies came scrambling into view like roaches crawling out of the walls. I had been active in Republican grassroots politics for longer than I had been eligible to vote. In high school I had dinner with my Congressman and gave speeches at public events. In college I interned at the Texas Legislature. I met Rick Perry right after he left the Democratic Party. In Houston I was a donor and volunteer for Associated Republicans of Texas through which I worked on state and local campaigns. And in suburban Chicago I became a local Republican precinct committeeman in 2006. With McCain swept to the margins and radicals firmly in control, by 2009 one could no longer be a Republican in good standing without serious moral qualms. It still seemed possible that the party could right itself, but the Tea Party movement had ushered in a wave of racist rhetoric and policy unprecedented in the party’s history. To remain in the GOP with a clear conscience meant finding an outlet through which to describe and work toward an alternative Republican future. Worse, there was no way to coherently express my thoughts on current events in a blog without creating a record that would ruin my standing in the party. Any hope I might have of one day taking a prominent role on a campaign or even running for office myself would be destroyed. Ideally, I would have preferred to develop and express these ideas behind the scenes, but all receptive forums had been burned to the ground. Any dissent would have to be public and nothing poisons a political career like candor. I didn’t read or follow blogs. For the most part, I still don’t. But faced with a lack of alternatives and a very persuasive wife, I kissed my political career goodbye and built a blog. Across the spring of 2009 I began writing out my thoughts on the state of the Republican Party. The first posts appeared on a goofy little free WordPress blog that still exists, awkwardly titled ‘Building a Better GOP.’ The effort had two objectives. First, I hoped that I might take a place among a growing chorus of Republican reformers. I hoped that we might link our efforts and steer the party back toward sanity. Second, I wanted an outlet for dissent, a means to gain absolution. If the party couldn’t be reformed, then I at least wanted proof that I hadn’t been a spineless collaborator. Later in 2009 I began posting some material in the Houston Chronicle’s public blog section. That’s when things started to get interesting. There’s a commenter still posting at GOPLifer who was the first person to comment on one of those Houston Chronicle posts. Others soon joined, many of whom are still engaged here at the Lifer blog. Though I produced some good material, it was the comments section that really stood out. Thanks in large part to activity from the community on that blog, posts from the ‘GOPLifer’ occasionally topped the Houston Chronicle’s list of most active pages. In 2013 the Chronicle made some changes to its blog platform that undermined the usefulness of the comments section. This frustrating development required me to consider a new direction. I ginned up a logo using photoshop, bought a domain, and launched GOPLifer.com. For a while I posted pieces in both places, but by this year the flow to the Chronicle had dropped to a trickle. GOPLifer had become the home for this new community. Right up to the summer of 2016 I still felt some hope that Republicans might change the party’s direction. However, by late spring it looked like a worst-case scenario was taking shape instead. In June I had started drafting a potential resignation letter, but I still hoped I could delete it. That’s not how things turned out. After the convention I sent my resignation letter to our local party chairman and posted it on social media. I cut my last ties to the Republican Party. The ‘GOPLifer’ project was over. After a few months spent mourning and exploring new directions, PoliticalOrphans.com is now ready. I have no idea what comes next for me politically, but I at least have a place to wrestle with that question. Joining me are a few collaborators who have offered to provide advice and content. As I close up the GOPLifer blog I want to acknowledge some of the support I’ve enjoyed over the years. Dwight Silverman played a key role in getting this project off the ground. When he headed up the Houston Chronicle’s interactive journalism efforts he fostered this blog project. Thanks to David Frum for giving me a place at FrumForum and guiding me past some bad writing habits. Thanks to the company I work for and my clients who have patiently tolerated my occasionally public personal project. Thanks to Avik Roy who has offered me a new forum at Forbes from which to opine. A special thanks to the hundreds of people who consistently participate in the comments section. You have created something remarkable there which I hope will grow even richer on a more suitable platform. I want to thank all the friends and family who supported this effort by encouraging me to write and by posting GOPLifer articles all over social media. Most of all I want to thank my wife and family. This was her idea and she pressed me to make it happen. Then she endured the toll this has taken on my free time and hers. She has tried to edit out my most glaring grammar errors and talked me out of some poor concepts. We’ve had a great run here together. Time to move forward. Hope to see you all at PoliticalOrphans.com. Mike Pence was reportedly “beside himself.” Paul Ryan disinvited the nominee from his big shindig in Wisconsin today. Rep. Chaffetz and other prominent Republicans publicly withdrew their support. Though a bit more profane than usual, the video is entirely consistent with everything we’ve known about Donald Trump all along. Why are Republicans suddenly outraged by this? Republicans didn’t care how vile Trump is when they thought he might win. There’s a sick, disturbing power-worship in the way Republicans have handled Donald Trump, going all the way back to his campaign announcement. The way they cower when it looks like he’s winning and pounce when he looks weak is revolting behavior in a bunch of adults. Mike Pence wasn’t “beside himself” because he had learned something new about the man he agreed to support. He was upset because it was finally clear that Trump was collapsing, and that the rubble would come tumbling down on him. These people following Trump, many of whom I had respected until very recently, are disgusting. Our election cycle isn’t nearly as long as we think. Media coverage and the fevered hype from those of us who pay attention makes it seem like Americans spend half of each Presidential term electing the next one. That really isn’t the case. Only about one in three of the Americans who will vote for President bothers to tune in to the primary process. Our election cycle actually runs from just after Labor Day to November. A minority of the country is paying attention before October. If it seems like the whole character of the process changed after Labor Day, that’s because the rest of the country suddenly joined the party. Keep that in mind in 2020. Did you hear Donald Trump’s speech announcing his candidacy? Did you read his comments about POW’s? Did you see the way he treated Megyn Kelly after the first Republican debate? Did you see his comments about the Khan family? Have you had the slightest awareness of his multiple messy divorces and sordid private life? What does it take to make Republicans feel something for another human being? No one has the slightest basis on which to act surprised. We have all been on notice since day one that this man is a horrid, destructive cretin. For some reason, millions of Republicans were willing to set that aside and make him our President. For Republicans who are shocked this morning, ask yourself why. Why were you willing tolerate this? The Trump scandal no one cares about. As a private citizen, Trump played a significant role in the campaign to railroad the Central Park 5, including a concerted effort at the time to reinstate the death penalty. Years after we discovered to our shame that those teenagers had been wrongly convicted, Trump this week defended his role in the case and insisted that they are guilty. My fellow Republicans, THAT’s the man you were proposing to place in command of the Justice Department. Again, no one in the GOP cares when Donald Trump says (or threatens to do) horrifying things to racial and religious minorities. This is a problem, folks. Maybe “political correctness” isn’t such a bad thing. Maybe, just maybe, it isn’t OK for people to go around spouting bigoted, ignorant slurs about other human beings they don’t understand. Perhaps the world might be a better place if we gave the slightest thought to how the words we choose affect other people. Here’s a thought for my friends still in the party: if Republicans weren’t so cavalier about so-called “political correctness” you might be winning this election. I’ve argued for a long time that America doesn’t have a politically relevant pro-life voting bloc. Scratch the surface of the so-called pro-life movement and waves of misogynistic spiders come pouring out. It is impossible to conceive of a political movement genuinely interested in the dignity of life that would line up behind a man who pours out invective against refugees, religious minorities and women. Yet, even this weekend, those sick, confused bastards keep defending him. This would be a better country if we recognized that Tim Kaine is a far better intellectual ambassador for the pro-life movement than Mike Pence. As Republicans pick through the rubble of this election cycle, hopefully someone will explore whether a minimally self-aware pro-life movement might offer some hope for the future. The greatest challenge for Republicans in coming years, if the party is going to remain intact, is empathy. While the rest of America works its way forward toward a culture capable of respecting and protecting people beyond the bounds of clan, tribe and race, Republicans remain trapped inside a tribal fortress. Republicans seem like nice people, people like Mike Pence and Paul Ryan, who are nonetheless bafflingly incapable of grasping the humanity of people beyond their kinship groups. Black people are real human beings who feel things. Muslims are just like you. Mexicans want good things for their children. These simple statements seem to stick in the throats of Republican leaders. Why? Seriously, why is that so hard? The challenge facing the Clinton Administration. Hillary Clinton is about to assume leadership over a nation of people who didn’t particularly want her in charge. Many of us who will be voting for her feel confident about her competence and intelligence, but there is nothing in her policy agenda that attracted us. She hasn’t threatened to do anything stupid, criminal, cruel, or insane, which makes her an empirically superior choice over any of her rivals for the White House. That’s her campaign in a nutshell. That isn’t her fault. She seems like she was prepared to run and win a campaign based on policy and vision and ideas. But this is how events played out. I am not exactly your average low-information voter. I have degrees in Political Science and Law and have been an active political volunteer for almost three decades, but I don’t even know what her tax plan looks like. When your house is on fire, do you ask what kind of water the firemen plan to use? I’m confident I’ll pay more taxes under Clinton than Trump. Frankly that seems fair. I’ll happily write a check to hold off Fascism (or its cousin, Idiocracy) for a few more years while we all work out some alternative plans. She is a remarkably capable political operator. She will need every ounce of those skills to build a governing coalition from the alignments she rode to victory. That is all. Enjoy your weekend. If things come together we should have a new site ready by early next week. NBC released a new national poll this morning that’s pretty consistent with the rest of the pack. It gives Clinton a six point lead over Trump, 46-40. It also shows Johnson at 9 and Stein at 3. We’re past the point at which Trump could hope to close the gap. There’s been no great wave of new white voters in PA, OH, WI or MI. Republicans have not consolidated around him. He’s shown no secret competence that he was hiding during the primaries. He’s toast. So let’s play. How do think the final numbers fall? We should expect that Trump will continue to flail. His behavior will grow more erratic and offensive as the outcome becomes unavoidable. With defeat certain, his veneer of winnerness is being stripped away. People who stuck with him because they thought they had to will start to flee their cages. Today Trump is polling at about 40%, which is about where he’s been since May. He still has a pretty firm floor in the upper thirties. Clinton has been hovering at 46-47. Obama went into the ’12 election polling at 48 and finished at 51. That swing was partly about undecided voters finally pulling the lever, but it had more to do with a built-in advantage in the Democratic coalition. Dems enjoy remarkably solid support in concentrated, heavily populated geographies. That leaves their Presidential candidates almost always underpolled in national surveys. Also watch for some twisting in the third-party outcomes. Johnson will underperform his polling by a pretty big margin in important states like Colorado, North Carolina and Florida. He is likely to score big numbers in places like Texas and Georgia that aren’t supposed to be competitive as disgusted Republicans revolt. That may be enough to tip Georgia to Clinton, though probably not enough for Trump to lose Texas. At those numbers nationally, Ohio and Iowa might still be close. If she only gets to 50% nationally she’ll probably lose those two states. Anything less than 53% nationally is probably too weak to flip Texas or Missouri. At my estimate for Clinton Democrats would probably pick up seven seats in the Senate, but fail to take the House. We’ll see. Early voting has already started in a few places. It will be over soon. For that we can be grateful. As I’ve written previously, I campaigned for Illinois Senator, Mark Kirk, in 2010 and was pretty enthusiastic about his potential. Since then I have been bitterly disappointed to discover that I was just giving Ted Cruz one more vote in the Senate. Sensible figures like Susan Collins and Mark Kirk have come to play a toxic, enabling role in the GOP’s descent into madness. Their placid party loyalty lends credibility to outlandish characters like Louie Gohmert, Ted Cruz, Steve King and Donald Trump. Republican leaders like Kirk cannot continue to evade responsibility for the extremism they legitimize. Until someone in the Republican Party is willing to take a visible, courageous stand for sanity in the style of John McCain circa 2000, there is no reason to keep electing them. Any vote for a supposedly “sane” or “reasonable” Republican unwilling to confront the party’s extremes is a vote for those extremes. Electing Mark Kirk is a mistake Illinois voters are unlikely to repeat. Kirk has no shot at retaining his seat in a Presidential Election year, but it’s still important to look at the impact of his Senate career. Those who still think they are going to steer the GOP back toward sanity from the inside can learn a lot from previous failures. From Politico: Get ready for A LOT more of this as the firewall between politics and celebrity disintegrates – Curt Schilling says he’s planning to run against Elizabeth Warren for Senate. From Evonomics: Economics may finally be adapting. A look at evolutionary economics. From New York Times Magazine: A look at Baltimore Prosecutor Marilyn Mosby and the Freddie Gray case. From The Texas Tribune: Democrats are making new investments in Texas. From Neurology: An open letter from Robin Williams’ wife describing his experience with a neurologic disease. It can be tough to make sense of calls to “Make America Great Again” unless you remember a time when all of the best that America had to offer was set aside just for you. For a new Forbes post I looked at some of Trump’s most committed supporters by age range, voters at age 70, and examined the world in which they were raised. White voters born in the same year as Donald Trump would spend much of their lives in a world crafted to reinforce their sense of racial superiority. They came of age protected like a Soviet state-owned factory. Exposed suddenly to competition, some are not thriving. They are experiencing very real trauma as the world they once knew, a world dedicated to their protection, erodes away. Explanations are not excuses, but history can at least shed light on their otherwise baffling behavior. For the last Jim Crow generation, making America great again has a special meaning. What was great for them was not quite so great for everyone else. No offense to the many septuagenarians who light up our comments feed. Interested in your thoughts on it. In other news, we are about two weeks from having a new blog/forum site ready. The GOPLifer is closing in on parole. Let’s hope I don’t get shivved before the release date rolls around. Almost there. As the GOP has evolved into America’s party of white nationalists they have locked themselves out of the White House for the foreseeable future. The emergence of an Electoral College Blue Wall, consisting of states too diverse to be won with racist appeals and too populous for Republicans to overcome, has Democrats optimistic about the prospects of dominating national politics indefinitely. That development is not as positive for Democrats as it might seem. The Blue Wall casts a shadow that obscures the debate, discussion and compromise necessary to build sound policy. 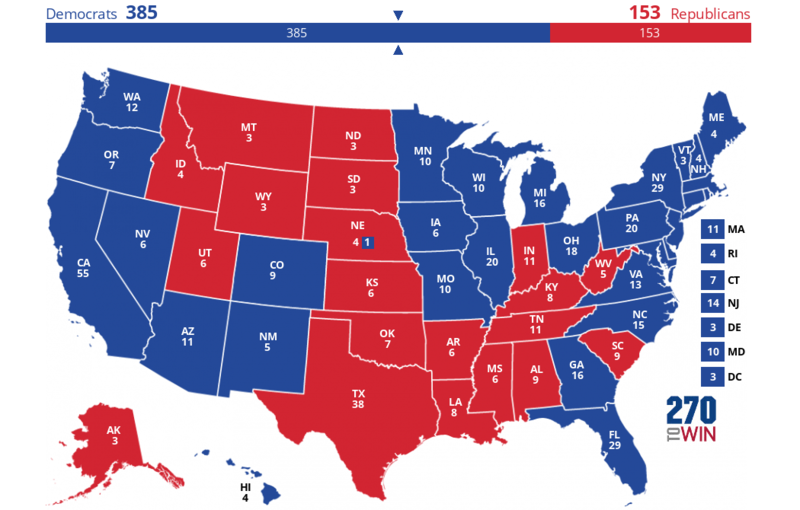 Electoral College dominance by Democrats threatens a long, suffocating red/blue stalemate, with Democrats complacent in control of the White House and Republicans content to play a blocking role in Congress and red state legislatures. A new politics of racial resentment threatens to snuff out policy debates. From Scientific American: A DNA analysis of the global spread of house-cats. From The Daily Dot: Don’t act surprised. George H.W. Bush, who fought Fascists in the Pacific, will be voting for Hillary. From Quartz: Interesting essay on Fascism in the context of Donald Trump, with interesting implications for the modern GOP. From the Washington Post: Colorado voters remain supportive of legalized marijuana. From Chicago Magazine: A strange and surprising portrait of gang life in Chicago. A young girl from Flint who became the face of the city’s water crisis got opportunities this year to meet both President Obama and, later, Donald Trump. Here are photos from each of the events. That is all. Enjoy your weekend.